The VPF standard provides Debrief users with the ability to display the contents of a number of different vectored databases. 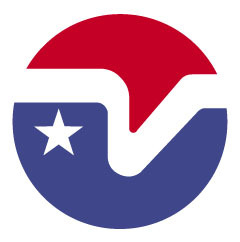 VPF(TM) is a Registered Trademark of US National Imagery and Mapping Agency. One of the databases, the Vector Map (VMap) Level O is an unclassified global database of many features, including coastlines, depth and elevation contours. This is the favoured VPF database for use in Debrief. But note that Debrief makes no assumptions of or optimisations for the VMap data - any VPF data source can be used. Debrief can also import Digital Nautical Chart (DNC) databases. The Digital Nautical Chart is produced by the National Imagery and Mapping Agency (NIMA) and is an unclassified, vector-based digital database containing maritime significant features essential for safe marine navigation. The Vector Product Format (VPF) is a standard format, structure, and organization for large geographic databases that are based on a georelational data model and are intended for direct use. VPF is designed to be compatible with a wide variety of applications and products. VPF allows application software to read data directly from computer-readable media without prior conversion to an intermediate form. VPF uses tables and indexes that permit direct access by spatial location and thematic content and is designed to be used with any digital geographic data in vector format that can be represented using nodes, edges, and faces. VPF defines the format of data objects, and the georelational data model provides a data organization within which software can manipulate the VPF data objects. A Product Specification corresponding to a specific database product determines the precise contents of feature tables and their relationships in the database. In this context, each separate product or application is defined by a Product Specification implemented by using VPF structures. VPF data is stored in a structure described in the Military Standard, Vector Product Format, MIL-STD-2407 . The Standard specifies the structure for directories, tables, table columns, table join relationships, and media exchange conventions for all VPF data. The data structure itself can be thought of as a template or skeleton within which the geospatial features and metadata are stored. While the Standard describes the structure, it does not describe the contents of a set of VPF data; this is the role of "VPF Product Specifications." Vector Map (VMap) Level 0 is an updated and improved version of the National Imagery and Mapping Agency's (NIMA) Digital Chart of the World (DCW). The primary source for the database is the 1:1,000,000 scale Operational Navigation Chart (ONC) series co-produced by the military mapping authorities of Australia, Canada, United Kingdom, and the United States. The complete database is available on a set of four CD-ROMs and contains more than 1,800 megabytes of vector data organized into 10 thematic layers. VMap Level 0 includes major road and rail networks, hydrologic drainage systems, utility networks (cross-country pipelines and communication lines), major airports, elevation contours, coastlines, international boundaries and populated places. VMap Level 0 includes an index of geographic names to aid in locating areas of interest. VMap Level 0 is accessible directly from the CD-ROM or can be transferred to a hard drive and used in many geographic information system (GIS) applications. VPF data can be obtained from a number of different sources, although the main resource is the NIMA web-site itself. In the UK, the Director General of Military Survey (DG Mil Survey) were able to provide the VMap database (charged to a Royal Navy UIN). If/when you find other sources please provide feedback and this page will be updated. Searching the Internet will undoubtedly provide other sources for the information - it's probably worth shopping around. Since the data is in the public domain agencies only have to charge a "handling fee". Now insert the first VPF CD-Rom and view it through your file manager (e.g. Windows Explorer). You need to find which directory contains the actual data, so have a look in each of the top level directories for a directory which contains the files DHT and LAT. Note, for VMap data this is a directory named VMAPLV0. When you've found this directory copy it across to the VPF directory you created on your hard disk. So for VMap data, your hard disk you should have a directory named VPF, containing your first set of VMap data in a directory named VMAPLV0. You will be copying in a number of data sets with this directory name, so rename VMAPLV0 to the name of the current dataset (such as NOAMER, SASAUS, EURNASIA or SOAMAFR). Next, swap your CD for the next CD in the series, copy the directory of interest across to the VPF directory on you hard disk, and rename it. Once you've repeated this process for all of the CDs for the current database it's time to configure Debrief to load the data. 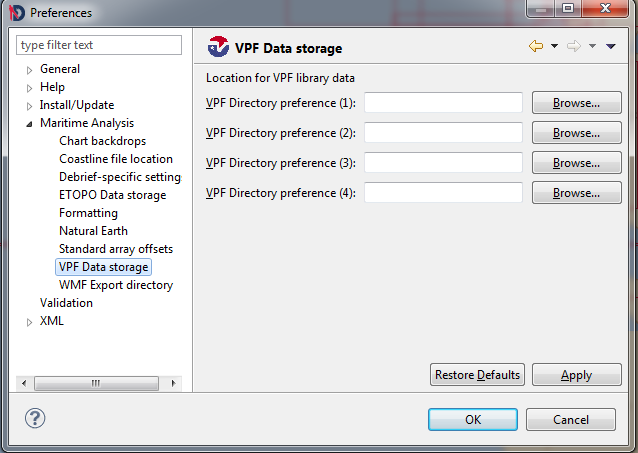 Debrief determines where to find the VPF data using the VPF Data storage tab of the Preferences dialog from the Window menu. Indicate the four data-file locations using the file-browser buttons. As many of you are probably aware, Debrief is an Open Source application, which means that anybody is free to copy, change, and re-use the Source Code for Debrief, provided they meet the terms of the Debrief license. The VPF plotting libraries we're using in Debrief are taken from another Open Source application, OpenMap from BBN Technologies. The OpenMap application can be found at http://www.openmap.net. Debrief makes no modifications to the OpenMap application code.